Organizing an event for a larger group of people can be stressful. 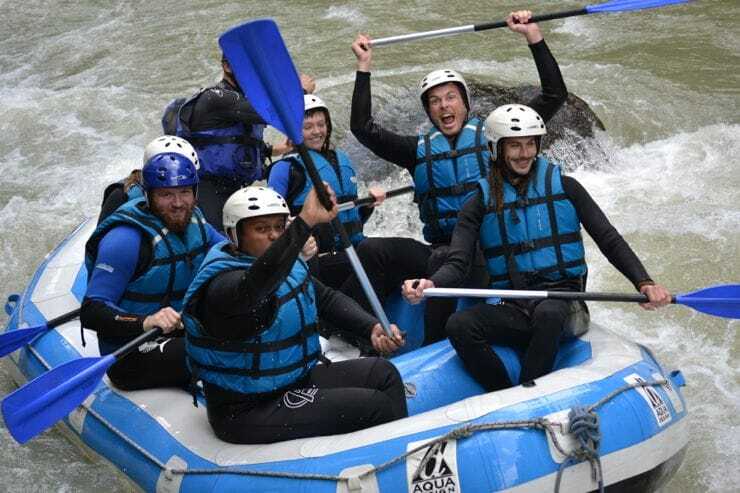 Whether you're the best man or maid of honor for a stag or hen party, responsible for a team-building day out, or trying to ensure a big family occasion is suitable for young and old, Frogs Rafting can help you organize an appropriate activity and send you off with a day memorable for all the right reasons! When you're responsible for ensuring that everyone enjoys themselves, from the adrenaline junkies to the less intrepid, choosing the right activity can be daunting. White-water rafting is an incredibly versatile activity, suitable for anyone who can swim. You have the option of three trips: the Classic, Inbetween or the Pro. No matter which trip you choose to do, the descent is tailored to your party. Our guides have a wealth of experience taking all sorts of crews down the river, and strive to help each group make the most of their time on and/or in the water! We will discuss with you what kind of trip you're after (a leisurely cruise down the river, or a full on dunking) before you go, and can deliver either, or anything in between, with pleasure! The only requirement is that everyone taking part can swim 25ms in calm water without aids. We recommend for the Pro Trip that participants are confident in water and over 16 years of age. Being a small base we lucky enough to be able to be very flexible: we can make sure you have the entire base at your disposal after the trip should you fancy drinks and snacks after your trip. Our guides take videos and our photographer will be snapping away from the river bank all the way down the river. If you'd be interested in drinks, snacks and / or photos and films of your trip we can organize this in a package for you. Please do ask me about what you require when you come to booking, so we can help make your day stress free, enjoyable and memorable!